Will Martin has been the music teacher at the Children’s School in Boise since 2003. Prior to that, he worked as an elementary general music teacher for eight years in Oregon and Washington; high school vocal music teachers and choir conductor for one year; and the Lincoln Center Arts-in-Schools program for four years. He was a director/conductor of the Oregon Children’s Choir for 15 years. Will has also had a long and varied career as a performer. He has created and performed many classroom presentations and assemblies for children, including the Dynamo show, developed with funding from the Lane County (Oregon) Housing Authority. He has acted and sung with the Oregon Shakespeare Festival, Oregon Repertory Theater, Eugene Opera, and numerous other performing organizations. Will and his wife served as volunteers in the United States Peace Corps in the Philippines in the mid-1990s. He trained teachers in the facilitating the teaching of English through music and song. Will Martin earned a B.A. in Vocal Performance for University of California, Santa Cruz, and a Master of Music Education Degree from the University of Oregon. 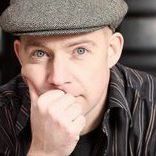 He has completed Orff Level Training, and practices an eclectic style of teaching to facilitate learning of and positive attitudes towards music. Vashti holds a Bachelor of Arts in Music from Mesa State College (now Colorado Mesa University) in Grand Junction, Colorado and a Master’s of Music/Vocal Performance from Western Washington University in Bellingham, Washington. 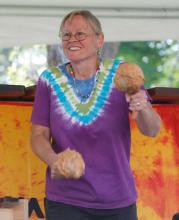 She also has her teaching certificate, an Orff Level 1 certificate as well as World Music Drumming Level 1. Vashti has an extensive performance as well as teaching/directing background. Previously, Vashti was the music teacher at Sage International School. Vashti founded and served as artistic director of Open Door Children’s Theatre which has now evolved into Open Door Music Studio. Through her work with Open Door, she has worked with several schools and other organizations to create and direct children’s performing arts programs. Her professional performing regional musical theatre credits include Seattle’s Fifth Avenue Theatre, Seattle Civic Light Opera, Bumbershoot, Oregon Cabaret Theatre (Ashland, OR), Bigfork Summer Playhouse (Bigfork, MT) and Operafest! at Great Woods Music Festival in Norton, MA. Vashti considers it her life’s work to build community through the arts and the Intergenerational Choir embodies this spirit! It is one of her most favorite projects! Visit Open Door Music Studio! Chad is a mix of musician, songwriter and marketer. For the past 12 years he has led a double-life as a musician masquerading as an interactive marketing guru for a fortune 10 high-tech company with a really short name. It's a good mix and all parties are pleased with the arrangement. in San Antonio, and working as a singing waiter on The Spirit of Puget Sound in Seattle. Chad continues to work on singer/songwriter projects, his most recent being 4 songs based on "Volt: Stories," a critically acclaimed book by Boise author, Alan Heathcock. I was raised in a family that loved to sing together. In college, I continued to sing as well as studying ear training, music theory, history, and jazz theory/arranging. After starting a family, I taught Music Together ®, a parent/child music program that encourages parents to become musical role models for their infants and toddlers. The playful creativity of this program inspired me to try Zimbabwean-style marimba. My chance came in 2006, when our family relocated temporarily to Moscow, Idaho. I joined a marimba band associated with the University of Idaho and quickly found a passion for mallets on wood and the African grooves that pull you out of your seat. I built my first marimba and began gathering tunes at annual festivals and workshops. A year later, we moved to Boise. As there were no teachers or bands here, I soon realized that to play this music, I would have to start building a community by teaching others. So began Marimba Boise. Since then, I have had the privilege to meet many wonderful and talented people, collaborate with community and school choirs, and perform at a variety of venues around town. It continues to be a joyful adventure.